The past few weeks we've spent a great deal of time discussing the recent downgrade of the US Credit Rating and our nation's debt. It's time we pay special attention to our individual financial profiles and get the skinny on our personal credit scores. FICO stands for Fair Isaac Corporation. Fair Isaac Corporation is the firm that created the formula that determines the three-digit score that individuals know as a FICO Score. Fair Isaac works in partnership with the credit bureaus. They then sort the data from the credit bureaus into five categories below and come up with a score between 300 and 850. Payment History (35%) - Aside from extreme events, like bankruptcy or tax liens, late payments have the greatest negative impact on your score. Recency and frequency of late payments count too. In other words, even though a 60-day late payment is not as risky as a 90-day late payment in and of itself, a 60-day late payment made just a month ago will count more than a 90-day late payment from five years ago. Outstanding Balances (30%) - Evaluation of your total balances in relation to your total available credit on revolving accounts is one of the most important factors in the FICO score. Owing a great deal of money on many accounts or "maxing out" on various credit cards can indicate that a person is overextended, and is more likely to make some payments late or not at all. 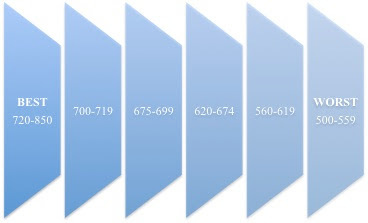 Length of Credit History (15%) - Your score takes into account how long your credit accounts have been established in general, how long specific credit accounts have been established, and how long it has been since you used certain accounts. New Credit (10%) - Research shows that opening several credit accounts in a short period of time does represent greater risk-especially for people who do not have a long-established credit history. Multiple requests will reduce your score because it looks like you are either trying to get a high amount of credit (possibly because of a cash flow problem) or that you are being rejected by lenders and having to apply elsewhere. Types of Credit (10%) - The score will consider your mix of credit cards, retail accounts, installment loans, finance company accounts and mortgage loans. Your score takes into account what kinds of credit accounts you have, and how many of each. The score also looks at the total number of accounts you have. Your FICO Score is based on your spending habits, timeliness of bills paid and your overall debt load. These activities make up your financial profile. Your profile includes all lenders, utility companies to credit card companies whom you do business with, these entities then file reports on your financial activities and behaviors to the credit bureaus. To put it mildly, these credit bureaus know your every move and then use Fair Isaac’s formula to calculate your FICO Score. 300 – 500 This range indicates that you are a financial calamity and its very likely you will be unsuccessful in finding anyone to do business with you, because you are seen as a substantial risk. Ultimately your goal should be to get you score into the 720 – 850 range. At this point you are someone that everyone wants to do business with and you will be privy to the best deals and the lowest interest ratings for borrowing. 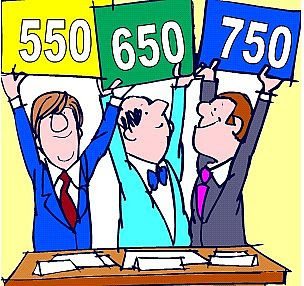 Someone with a score of 720 will have access to the same interest rates as someone with a score of 850. The same works for all the ranges above. Length of credit history is another important credit score factor, so it can be to your advantage to keep older accounts in good standing open. While you want to keep the total number of accounts manageable, sometimes it can hurt your score more to close an old account than to keep it open, even if that means you have more open accounts. While new credit is the least important factor in your score, it is still an important issue to consider. When you are shopping for a new loan or credit card, do your shopping in a relatively short amount of time. You don’t want to have your report show that you are constantly looking for credit. There are two separate types of inquiries - Hard Inquiry, these occur when you are seeking credit with a lender and a Soft Inquiry, most often when you access your credit report and are not seeking a loan or any form of credit from a lender. You also don’t want to open credit accounts you don’t intend to use. It may be tempting to get that additional 10% off when you open that new retail store card, but the little bit of money you save may be insignificant when multiple new accounts such as these actually lower your credit score. 1. Check your credit report once a year. Make sure everything is accurate and if you find mistakes be sure to dispute them. You can access your credit report for free once every 12-months via https://www.annualcreditreport.com. 2. Pay ALL bills ON-TIME. If you need to pay something late, contact the lender or company, sometimes they will waive the payment if you are a good customer. If the due date your lender assigned you, doesn't work well for you or allow you make timely payments, call and ask to change the due date, most will accommodate this request. 3. NEVER cancel or close credit card accounts. If you absolutely must close the account that was most recently open and has the smallest credit line. These are books, magazines and websites, which I’ve utilized over the years and found them to be realistic and extremely helpful. Fire Away - Ask any questions you have related to FICO Scores or Credit.